Do you offer disability insurance to your employees as part of your group benefits plan? If not, is this a coverage you have considered including? It is important to know the basics of disability insurance and how you can help your employees protect themselves financially should a disability occur. Disability income insurance is a type of health insurance that is intended to protect an employee from loss of income if they are unable to work for an extended period of time due to a disabling injury or illness. Payments are usually made on a weekly or monthly basis for a specified amount of time during the length of the individual’s disability. 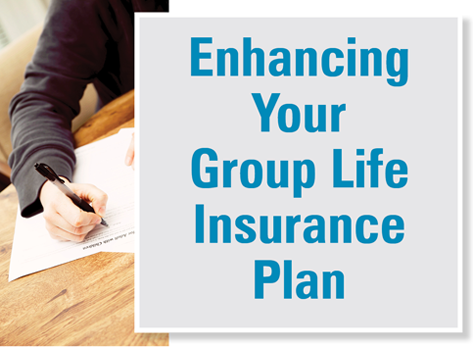 This is a type of insurance employers can offer in their group benefits plan for employees. Disability insurance does not provide coverage for work-related injuries and accidents that are covered by workers compensation. The Social Security Administration estimates just over 25 percent of today’s 20-year-olds will become disabled before age 67. This is a significant number of individuals who are at risk of losing their income due to disability. Disability insurance is actually one of the more affordable benefits you can provide for your employees. Including this coverage in your group benefits policy adds value to your benefits plan, which could help improve employee retention. Short-term disability insurance usually has a waiting period of 7 to 14 days before benefits take effect, and benefits pay out typically until long-term disability coverage begins or until the person is no longer disabled, whichever comes first. This can be employer paid or employers can provide this type of coverage as a voluntary benefit for their employees, which means the employee pays the full premium amount. Long-term disability insurance has a longer waiting period. Often the this type of policy takes effect after an employee has been out of work for 90 days or sometimes up to 6 months depending on how the policy is written. This coverage continues for a specific amount of time that is indicated in the policy or until either the individual returns to work, passes away, or becomes eligible for social security benefits, whichever comes first. Typically, employers provide this type of coverage as a group policy for their employees with the employer paying the premium. In a survey conducted by the Opinion Research Corp, more than half of the respondents indicated they do not understand group disability insurance. This extends to employees not even knowing if they are covered by a group disability insurance policy provided by their employer. In fact, 65 percent of employees indicated they believe they are covered by employer-sponsored coverage, yet only 32 percent of working Americans actually have access to long-term disability coverage through their employer (according to the Bureau of Labor Statistics). It is important for employers to educate employees on this coverage. Make sure they are aware whether or not you are providing group disability insurance and what they need to do to be covered under your policy. If you don’t offer disability insurance, inform your employees and encourage them to purchase their own coverage in order to protect their income. You might consider offering a voluntary disability program if you aren’t providing a group disability plan. There is no cost for you to offer this option, but it gives your employees the opportunity to purchase it on their own if they desire the coverage. Many workers think they are safer than they really are. They are underestimating their risk of disability and too often don’t think about protecting their income. Encourage your employees to take steps to protect themselves financially by purchasing disability coverage (either through the policy you provide or through a policy they purchase on their own) and to build up adequate savings to sustain themselves should a disability occur. As your group benefits insurance consultant, we can provide you with different options for a group disability insurance plan as well as options for coverage through voluntary benefits. We can also assist you in communicating the value of the plan to your employees and helping them understand situations when coverage can be applied. Accidents are not usually the causing factor behind disabilities. The majority of long-term disability cases are due to health issues such as cancer, back injuries, heart disease, diabetes, and arthritis. Most disability cases are not work related so they are not covered by workers compensation. A majority of Americans are not prepared – either they don’t have disability insurance and/or enough emergency savings to last more than 30 months. The average long-term disability claim is just over 31 months. You can achieve a positive return on investment with your wellness program by setting clear goals and demanding results. In order to do this, you will need to start with clear data regarding the health of your employee population. Analyze your group’s illnesses, patterns, and health problems and identify the areas that need improvement. Then set wellness program goals based on these issues. Once you have identified the health problems that are specific to your employees, design your wellness program to target these specific issues. With this targeted approach, you will see a change in the health costs related to these problems and ultimately a positive return on investment for the program. Individuals who live a healthy lifestyle typically live about six to nine years longer than those who don’t. Studies have found that workplace wellness programs that focus on helping employees make lifestyle changes are effective in reducing health costs and absenteeism. Having healthy employees means lower health care costs for employers and business owners. An employee wellness program can help improve the health of your employees; however, to be effective, it must motivate employees to change their habits and lifestyles. The following are a few suggestions for implementing advanced wellness initiatives to secure long-term health results. Encourage employees to set attainable goals (i.e. reducing body mass index (BMI) by 10 to 15 percent in one year). Provide support for reaching goals (i.e. free access to a weight management plan such as Weight Watchers). Provide rewards and recognition when goals have been achieved. The goal is to inspire behavior changes by providing tools and support that effectively help an employee reach attainable goals. 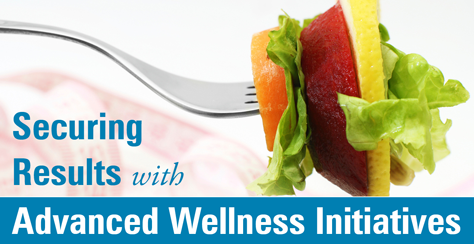 Historically, many wellness programs have been based on the idea that providing information on unhealthy behaviors to employees (via newsletters or websites) would motivate them to make changes and improvements to their lifestyles for better health. However, information alone is not enough to make a difference. The concept of employee health risk management goes beyond simply providing information. It actually helps employees manage their health risks. A wellness program centered on this idea will enable employers to identify the risks that are driving their health care expenses and devote attention to minimizing those risks. Employee health risk management utilizes health risk assessments to identify risks that could contribute to poor employee health and higher health care costs. It also utilizes biometric health screenings for early prevention of some health risks. Health risk management ties consequences to actions. For example, employees who join a gym and use it at least three times per week might be offered reduced health insurance premiums, or an annual bonus could be given to employees who agree to regular cholesterol and blood pressure screenings. The cap on wellness incentives is currently 20 percent of an employee’s total health insurance premium cost. The Patient Protection and Affordable Care Act (PPACA) increases this cap to 30 percent by 2014 (and to 50 percent for tobacco cessation wellness programs). With increasing funds being driven towards wellness programs, it is important to make sure those funds are spent with the purpose of improving employee health in the long run. 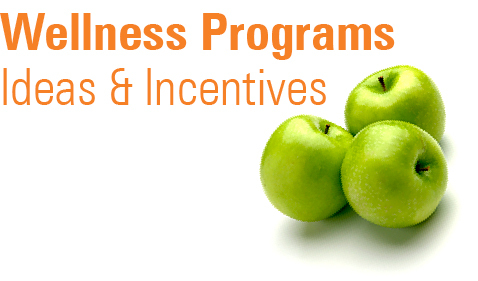 This will help improve the return on investment of your wellness program. By incorporating goal-driven incentives, support for reaching goals, and health risk management techniques, your wellness program will yield a healthier workforce and show improved return on investment. The coverages discussed herein are for illustrative purposes only. The terms and conditions of your specific policy may differ from those described. Please consult the provisions of your policy for the terms, conditions, and exclusions that apply to your coverage. Develop a communications strategy and get it in writing. Identify the goals you wish to accomplish and make sure your strategy works towards meeting those goals. Establish a reasonable communications budget. Identify how the funds in the budget should be used to meet the goals of the communications strategy. Trim communication costs by reducing or eliminating the use of traditional print and postal delivery methods and utilize less costly methods such as social media, podcasts, video, and email. Using a variety of venues will also help you to reach your employees more effectively as many of them may have different preferred methods of communication. Utilize communication venues that are already in place such as an internal company website or newsletter. Communicate year round with your employees. Don’t wait until open enrollment to start telling your employees about all of the great features of your health plan. Establish a set schedule that lasts throughout the year with the goal of informing and reminding employees about the plan. Frequent communication can also be helpful in motivating employees to participate in your company wellness program. More than half of employees (52 percent) are interested in being able to choose and pay for voluntary benefit options. About 66 percent of employees indicate that voluntary benefits increases the overall value of their benefits. 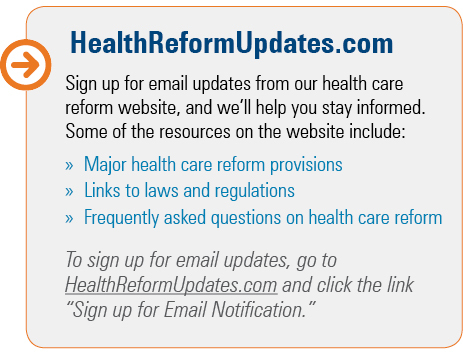 This newsletter includes information on voluntary benefits. 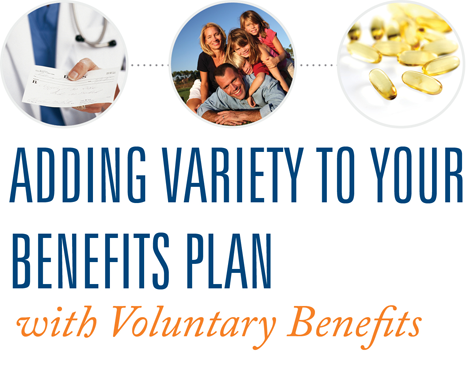 If you are looking for a low-cost, easily administered benefits option to supplement your current program, voluntary benefits might be right for you. Voluntary benefit plans are one way you can add variety to your benefits program without increasing the cost to your company. Offering voluntary benefits gives you as the employer the ability to offer your employees some degree of choice and customization. Voluntary benefits are employee-paid products that include a variety of health and non-health type options. Voluntary benefit plans actually date back to as early as the 1950s when they were known as payroll deduction or salary-savings plans. Though they have been around for a while, they are increasing in popularity with recent changes in the benefits environment. In addition, as more insurance companies enter the market for voluntary benefits, there are improved technologies and enhanced products, resulting in better offerings at a lower cost. 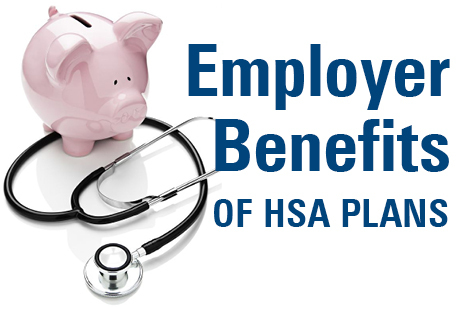 Voluntary benefits are available through employer-sponsored plans. Employers are able to leverage group purchasing power to provide these products and services to their employees at rates the employees wouldn’t be able to access individually. Voluntary benefits are a great tool for attracting new employee talent and retaining current employees. Amid cost cutting measures and cutbacks in company-paid health care, voluntary benefits provide employers an option for rounding out employee benefits options. Employees who sign up for voluntary benefits usually pay for 100 percent of the premium through payroll deduction. Most employers do not contribute to the cost of the coverage. 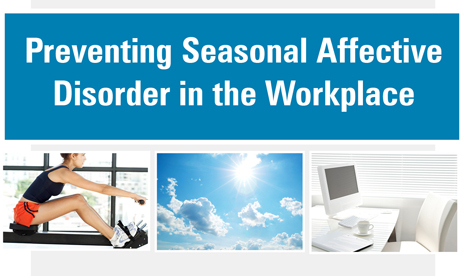 These products are affordable and are popular benefits your employees can take advantage of any time throughout the year, not just when they are sick. To learn more about voluntary benefits, please contact your Leavitt Group insurance consultant. Accidental death and dismemberment (AD&D) – offers insurance protection when a covered accident results in loss of life, speech, hearing, sight, or in paralysis. This coverage can be made available as part of the company-paid basic coverage, employee-paid coverage, or both. Will preparation services make will preparation simple for your employees. Often these services are available for your employees to utilize online, making it easy and convenient for them to complete their will. Estate planning and resolutions services gives beneficiaries access to legal assistance to discuss matters involved with settling the insured’s will and estate. Additional estate planning services are often available for a fee through various insurance companies. These products and services differ depending on the insurance company and plan you choose. Contact your Leavitt Group insurance consultant to learn more about what options will best fit the needs of your organization. 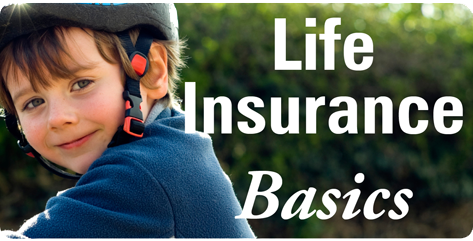 The primary purpose of life insurance is to offer financial protection to your dependents in the event of your death. An untimely death can leave loved ones with the burden of paying numerous expenses. 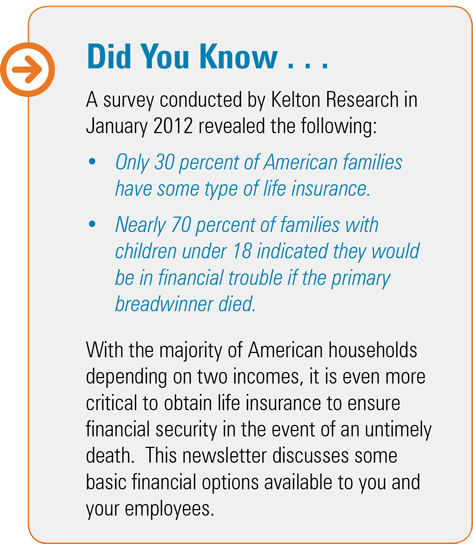 Life insurance helps alleviate this burden by paying money directly to your beneficiaries. It can help cover your family’s daily living expenses and help them maintain their standard of living. It can be used to fund child care and education and to pay off outstanding household debts including credit cards, automobile loans, and mortgages. Primarily used for temporary coverage. Typically purchased for a specific amount of time, generally one, five, 10, 20, or 30 years. Premiums are usually less expensive than permanent life insurance. Can be renewed at the end of the term; however, you must re-qualify for coverage based upon your current age and health conditions. The premiums on the renewal policy will most likely be higher due to increase in age of the insured. Benefits from a term life policy are paid to the beneficiaries only if the insured dies within the specified period of time for which the policy was written. Offers financial protection in case of an untimely death but also serves as a financial investment. Cash value increases each year and is tax deferred. Premiums are generally more expensive than term insurance; however, premiums will not increase over time. Guaranteed death benefit payout: since the policy is effective for the entire length of your life, your beneficiaries are guaranteed a payment regardless of when you pass away. Proceeds are generally income-tax free to your beneficiaries. No need for renewal -- coverage lasts for your entire life. Many businesses are faced with the issue of how to keep health insurance premiums low while still offering a good health insurance program for their employees. 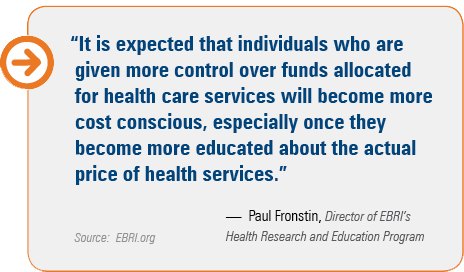 As health care costs continue to increase, this problem will only become more prevalent. One of the ways you can keep your premiums low while still offering significant options to your employees is to involve your employees in the cost of their health care. You can do this by encouraging your employees to make careful, thoughtful, and cost-conscious decisions when purchasing health care services. Many employers are implementing high-deductible health plans to help accomplish this goal. High-deductible health plans do not obscure the true cost of services as co-pay plans tend to do. 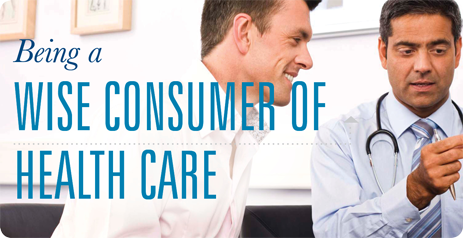 High-deductible plans are driven by the consumer as they motivate the consumer to research their options and choose not only what makes sense healthwise but also what makes sense from a cost perspective. This type of plan encourages the consumer to live a healthy lifestyle to prevent unnecessary medical problems, match the medical need with the appropriate level of service, and research to find the best cost option for medical procedures and refilling prescriptions. Being a wise consumer of health care doesn’t happen overnight, and it doesn’t mean putting off necessary services simply because a person would rather not pay for them. Rather, being a wise consumer of health care requires cost-conscious decision making along with living a healthy lifestyle. In regards to health insurance, some individuals may think, “I paid for it, so I’m going to use it,” or, “Now that I have met my deductible, I can use the plan all I want”? By instead keeping a “wise consumer” mentality, plan participants can avoid contributing to unnecessarily high health care costs. Following the steps below can ultimately lower the costs for health care services. Exercise and a healthy diet can help prevent a myriad of health-related problems. Research shows that people who are obese incur an average of $1,700 more per year in health care costs than those who are not obese. Even those who are overweight but not considered obese have been found to spend more on health care. In addition, smokers incur on average $1,600 more per year than nonsmokers. This type of plan can often be less expensive in the long run when considering the total out-of-pocket expenses, premiums, and company contribution to employee health spending accounts. 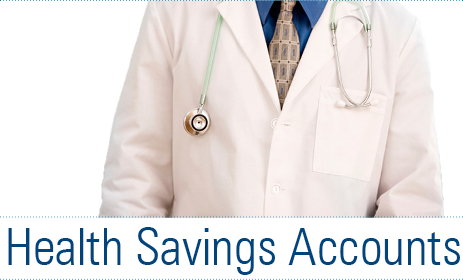 When a HDHP and HSA are combined, they also provide a tax-advantaged way to help individuals save for future medical expenses. By getting the medical screenings that are recommended for an individual’s age and gender at the appropriate times, many medical issues can be identified and cared for in the early stages when the cost is the lowest. Putting off these screenings will only worsen and prolong the problem. Those with ongoing health concerns should follow the recommendations of their doctors to help keep these issues from worsening unnecessarily. If a condition is life-threatening, call 911 or go to the emergency room. If it is non-life threatening, determine which course of action would be appropriate. For no cost, individuals can utilize home health care books, online medical websites, and nurse hotlines available through their insurance provider. If medical attention is required, go to the doctor’s office; or, if urgent but not life threatening, go to an urgent care facility rather than the emergency room. If a doctor recommends a medical procedure, it is a good idea to seek a second opinion. Individuals may be able to find a less expensive option that is more appropriate, or they may find that the original recommendation is not necessary at all. They should keep accurate records of tests and procedures and provide this information to their doctor to prevent repeating a procedure that is not needed. In regards to prescriptions, if they are not needed, then they don’t need to be filled. Also, individuals should ask for generic/lowest-cost or over-the-counter alternatives, obtain pricing from several different pharmacies to get the best value, and utilize the 30-60-90 day refill plan if available. Individuals should ask their provider if the cost can be reduced if paid in advance rather than waiting to be billed. If a bill is sent for a service, a careful review of the “Explanation of Benefits” document is key to ensuring that the services being billed for were received. Only the amount that the insurance company indicates is owed should be paid. These small actions can add up to big savings in health care expenses. By taking the time to do these things everyone can become wise consumers of health care. Increase in voluntary benefits sales. 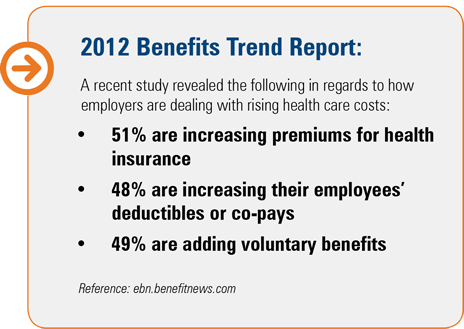 As employees are bearing more of the burden of health care costs voluntary benefit sales are increasing. In addition, there has been an increase in the use of third-party benefit providers handling enrollment and administration. Increase in electronic communication of benefits. How well you communicate voluntary benefit offerings to your employees will determine how they participate in the plan. Electronic communications allow more efficient and timely delivery of information to employees and also provides flexibility for addressing needs of a multicultural and multilingual workforce. Increasing popularity in specialty products. Products that have traditionally not garnered much attention are now becoming more popular. These include products such as critical illness, accident insurance, and hospital indemnity insurance. Bundling these products and including them in a voluntary benefits package helps supplement some of the changes in traditional plans. To learn more about voluntary benefits and third-party benefits enrollment and administration, please contact your Leavitt Group consultant. Many employers may be reluctant to ask for feedback from their employees because they don’t want to receive negative comments or suggestions that are unreasonable or difficult to implement. By using focus groups with employees, however, employers can uncover potential problems, get exposure to another point of view that might not have been otherwise considered, and discover ways to improve their benefits plan and employee communications. Here are a few ideas for conducting a successful focus group. These ideas can be utilized for a variety of situations, including assessing employees’ preparedness for change, implementing a new benefits plan, or making simple changes to an existing plan. Choose an appropriate number of employees to participate in the focus group. Generally 15 to 20 people in the group is enough to generate effective feedback while involving all participants. Select participants wisely. Consider what the goal is of your focus group and choose participants who will yield helpful information based on their demographics, business unit, geographic location, ethnicity, or employee level. For example, if you are trying to improve your wellness program and you have noticed employees within a certain demographic are not participating in the program, build your focus group with employees that fit that demographic to learn more about their point of view. Ensure confidentiality. Consider asking a third-party facilitator to conduct the focus group. This will help ensure confidentiality and anonymity and help employees be more candid and feel confident that there will not be retribution for what they share in the group. Establish ground rules at the beginning. Make sure participants understand the objectives of the focus group. If they know right from the beginning what you are trying to accomplish, this will help alleviate the tendency for participants to get sidetracked on irrelevant issues. Choose an effective and experienced facilitator. Without the help of a skillful facilitator, it might be easy for one or two focus group participants to take over and have his/her views mistaken as the opinion of the entire group. Make sure your facilitator is able to manage the group well enough that all participants are able to clearly communicate their own perspectives to the group. Capture initial opinions with mini-surveys. Consider asking all participants to complete a brief survey before the focus group begins. This will allow you to find out what the participants really think before they have been exposed to the opinions of others in the group. Follow up afterwards and let the rest of your organization know you have conducted a focus group. Communicate to the group your intentions of what will happen next and follow through. Failure to follow through will lessen people’s interest in participating in future focus groups because they won’t feel they have made a difference by sharing their opinions. Let your entire organization know you have conducted a focus group and share a summary of the results and what you intend to do going forward. As part of a benefits package offered to employees, many employers provide retirement options. 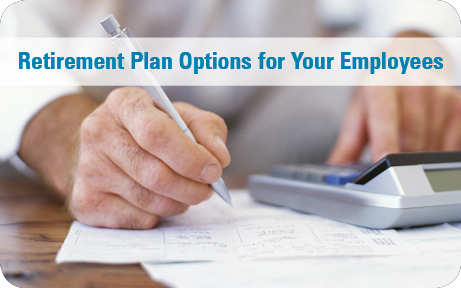 Two employee retirement plan options you can provide include a defined benefit plan and a defined contribution plan. The defined benefit plan provides a pre-defined monthly benefit amount at retirement. This type of plan is a pension that is based on the highest average salary attained by the employee as well as the number of pensionable employment years they completed. The plan is funded by both employer and employee contributions, and the funds are invested for future earnings. The defined contribution plan does not promise a specific benefit amount at retirement. The end value of the plan will depend on the amount contributed prior to retirement and how well the investments perform. Employees are responsible for their own account and determine how much to contribute and how the contributions are invested. Employers typically contribute to these accounts by matching a certain percentage of the employee’s contribution. Examples of defined benefit plans include the traditional 401(k) plan, SIMPLE IRA plan, profit sharing plans, and employee stock ownership plans (ESOP). Determine your retirement needs. Estimates suggest you will need about 70 to 90 percent of your preretirement income to maintain your standard of living when you stop working. Being aware of the amount of money you will need will help you stay on track for a secure retirement. Understand basic investment principles. A variety of factors will influence how much you will have saved at retirement, including inflation, type of investments, and how long your money has had time to grow. Pay attention to your investments and meet with a financial advisor on a regular basis to ensure you are staying on track to meet your financial goals. Diversify your investments to reduce risk and improve return. Knowledge equals financial security. 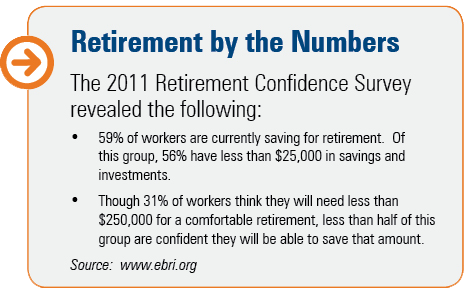 Contribute to your employer’s retirement savings plan. 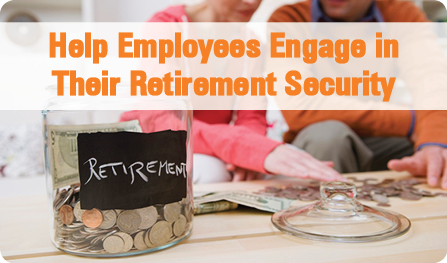 If your employer offers a retirement savings plan, start contributing. Set a goal to contribute at least enough to qualify for the full employer contribution. Set realistic goals and stay committed. Set a realistic savings and investment strategy to meet your financial retirement goal. Start small if you have to and increase the amount over time. The sooner you start saving, the more time your money will have to grow. Don’t touch your retirement savings. If you withdraw your retirement savings prematurely, you will lose principal and interest and possibly tax benefits. You may also have to pay withdrawal penalties. If you change jobs, don’t withdraw the savings; instead, roll them over to an IRA or your new employer’s plan. Invest in an Individual Retirement Account (IRA). There are two IRA options - traditional IRA or Roth IRA. The tax treatment of your contributions and the after-tax value of your withdrawal will depend on the type of IRA you choose. Annual contributions can be up to $5,000 and there are certain tax advantages in contributing to an IRA as well. Learn about your Social Security benefits. Review your annual Social Security statement so you are familiar with how much your estimated benefit will be and when you can expect to receive it. On average, Social Security currently pays benefits that are equal to about 40 percent of what you earned before retirement. For more information, visit www.socialsecurity.gov. Ask questions. While these tips provide suggestions for preparing for retirement, you need more in-depth information to determine your retirement needs and make sound investment decisions. Consult with a financial adviser for more detailed information and guidance. With increasing health care costs and major changes to the health care system, many employers are implementing wellness programs and health incentives for their employees. With a little creativity and participation from your workforce, you can create a wellness program that meets the needs of your employees and helps them maintain a healthy lifestyle. Sponsor fitness and weight loss competitions. Sponsor company sports events, such as softball tournaments or 5K races. Substitute snacks around the office with fresh fruits and vegetables. Provide a monthly cash incentive for meeting fitness goals. Offer discounted health club memberships. Give gift cards for health-related products and services. 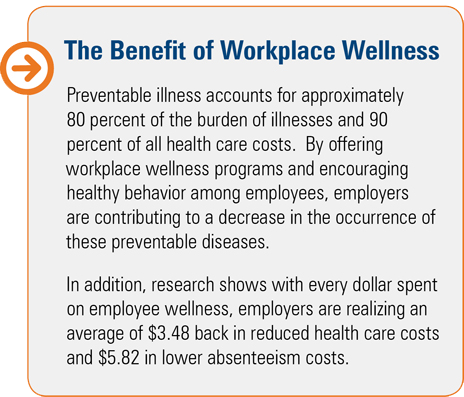 Wellness programs are a proactive approach to reducing health risks among your employees, ultimately reducing health care costs. An investment in a wellness program is an investment in your greatest asset - your employees. Desire to achieve better overall health. 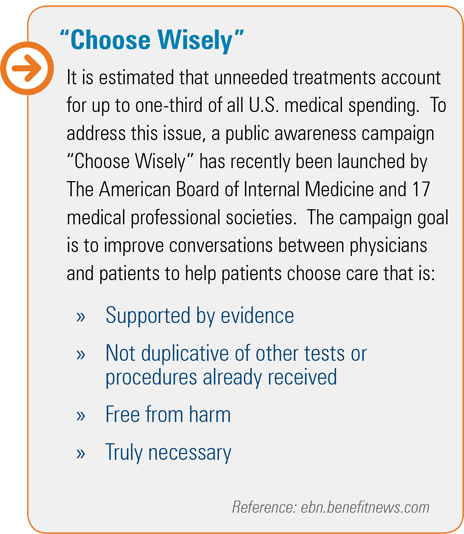 Reduce personal health care costs. Improved energy and productivity among employees. Employees will be motivated to work harder and perform better. Decrease in absenteeism due to illness. Decrease in health care costs as employees reduce unhealthy behaviors and maintain a healthy lifestyle. Gain control of illnesses, conditions, and unhealthy behaviors before they become more serious. Recruit and retain top talent - wellness programs can help employees feel more appreciated and also increase loyalty to the company. 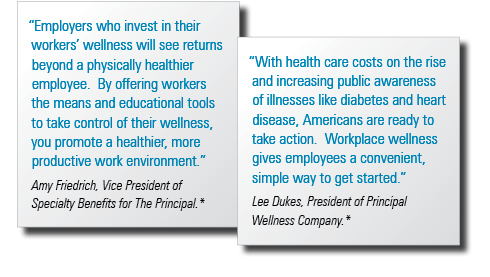 * “American Workers Say Wellness Works to Improve Health, Save Costs.” Business Wire. February 16, 2011.